MANDEM (the artist conglomerate fronted by FSU Art MFA ’15, Maize Arendsee) has multiple upcoming exhibits in the Cleveland area. Opening January 26: “Identity: People” at the Valley Art Center in Chagrin Falls, Ohio. 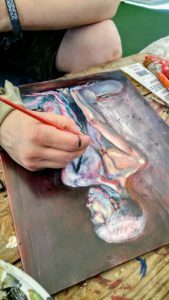 Juried by noted portrait artist Judith B. Carducci, this exhibit invited artists to submit work exploring the concept of “identity” in their own terms. MANDEM’s contribution to this exhibit is from their #Hypermobility series, which explores the concept of identity surrounding disabled experiences. The opening reception is Friday, January 26, 2018, 6-8pm. Visit https://www.valleyartcenter.org for more information. Opening February 2: “DayGloSho” at the Waterloo Arts Gallery in Cleveland, Ohio. The sixth installment of this annual event is a fascinating display of original glowing artwork in a myriad of styles from 40 artists. The opening reception is Friday, February 2, 6-10pm. Visit https://www.facebook.com/events/620084304989839/ for more information. Artwork by MANDEM also continues to be on display at ARTFUL, located in the historic Coventry Village district in Cleveland Heights, Ohio. Visit http://artfulcleveland.org for more information about ARTFUL’s studios and mission.